You’ve planned the perfect dinner date. The perfect candles, music, flowers, food, wine, dessert…wait, you forgot dessert! What to do? Imagine instead, you’re sitting working. It’s getting late. You feel yourself crashing, but you need to finish the work. You know that the only thing that will get you through is a sugar rush. Preferably a sugar rush induced by the best chocolate cake in town. Only, you don’t have time to go out and buy a cake. What to do? You open your Pinga app and ping your local Pinga partners — sending out a request asking for chocolate cake. Within minutes someone will reply that they have you covered. And in about half an hour, the chocolate cake arrives by your door. All you have to do, is receive it. Us Londoners have a romanticised idea about living in charming villages and small towns where people seem to be able to call upon their neighbours for anything and everything. It sounds blooming marvellous and it would be rather useful, wouldn’t it? The truth is though, not even the best of neighbours have a dessert waiting for us whenever we need one. 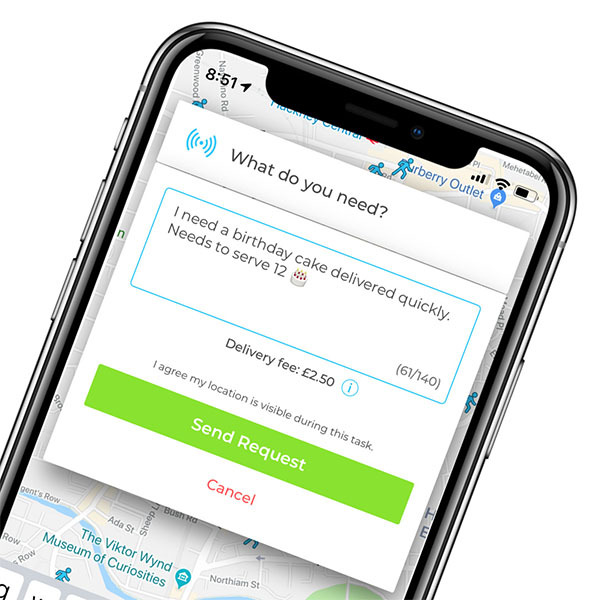 Our Pinga partners, on the other hand, can have a dessert delivered to your doorstep in no time. Dessert delivery is particularly useful on days when you just don’t seem to be able to leave your desk due to a mountain of work and on days when the housework is never ending. Try as you might, nipping out to buy a dessert just isn’t feasible. Of course, it is also great to have dessert delivery available when you realise you forgot to buy dessert for the party you’re throwing. Which starts in thirty minutes. There’s no time to go to the shop, and local stores take hours to deliver. Not to fret — Pinga will handle it for you. And if you need twenty candles to go with the dessert, or have a special request, such as a gluten free dessert, that’s no problem either. Pinga is easy to use. All you have to do is download the app and send a request for what it is you need. Your local Pinga network will handle it from there. And before you know it, what you need, will have arrived at your doorstep. There’s no minimum spend required, so you don’t have to buy the most expensive dessert in town either. In fact, you could just buy one slice of cake. It’s entirely up to you. Get what you want, when you want it. Try Pinga today. Gone are the days of minimum spend and being restricted to order products from a single shop. Pinga delivers what you want, when you want it. Describe your dream dessert and send your request. Pay securely within the app and receive your dessert!